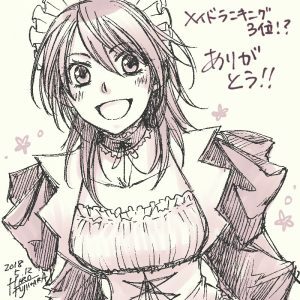 The official twitter account of the author has earlier announced that ‘Maid Sama!’ manga will be renewed for a special chapter on April 24. Hiro Fujiwara, the author of the original manga will be in charge of the publication of this latest chapter. Hakusensha’s LaLa shōjo manga magazine’s upcoming April issue will carry the latest chapter. From the facebook page, the author announced that a special volume of Maid-sama will be released on August 3. The said volume will also have a limited edition version with Drama CD included. The chapter will feature a story after the wedding of Misaki and Usui. For the links to the list of Kaichou wa Maid-sama specials and Kaichou wa Maid-sama! Marriage, check the featured comment below. The manga series ran from December 2005 to September 2013. The anime adaptation by J.C. Staff aired for 26 episodes between April and September 2010. Seika High School was an all-boys school, but it has since turned co-ed. Misaki Ayuzawa is the first female student council president of the school, eventually earning the nickname of the “Demon President” due to her mastery of Aikido and imposed iron rule. However, Misaki harbors an embarrassing secret—she has to work at a maid café to support her family. If anybody from her school was to find out, her reputation would be utterly destroyed. And after Takumi Usui—the most popular boy at school—discovers her secret, that might just happen. Kaichou wa Maid-sama! follows their story as they spend more time together and eventually begin to understand each other’s secrets. Currently, 18 volumes are available in print under the Hana to Yume Comics. If you love slow-paced romance then you should certainly give this a chance. Although the plot and the romance of the anime are predictable the story is interesting. The characters are not complex either yet they don’t fall short of amusing you. I liked the subtle romance and the intense expressions using simple gestures. Also, the anime art was good and I loved the character designs. Finally, this is a series that if you would come to like it you would love it very much.